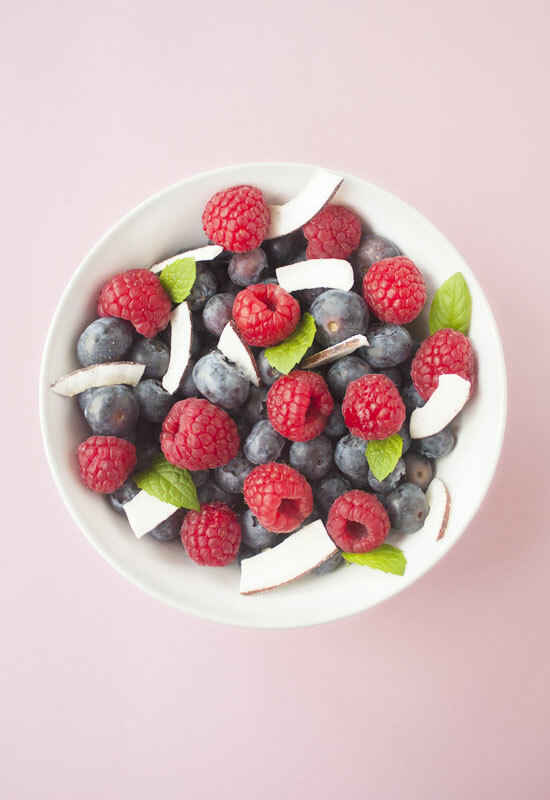 This berry coconut fruit salad is one of my easy, quick snacks before an early morning yoga class. It’s light enough to do a good workout afterwards and provides you with enough energy to get started. I always have berries at home. Fresh ones in the summer and frozen when they’re out of season. Like with anything, fresh ones are the best and even better is picking them yourself! They come in many variations and are typically summer fruits. Strawberries, blackberries, raspberries, mulberries, red currants, elderberries and gooseberries are some of the most popular berries that range from very sweet to very sour. Berries are rich in antioxidants and help protect your cells from damage. They are great for your heart, brain, immune system and for weight control. Besides their many health benefits, they just taste really good. Berries are a great addition to smoothies, desserts, in fruit salads, for baking or just by themselves. Because they contain fat-soluble vitamins they need fat in order to be absorbed by our body. To get all their health benefits, I always eat them with some type of healthy fat. This can be some type of nut butter or a coconut product. I find that both fresh coconut or natural coconut chips go amazingly well with all types of berries. 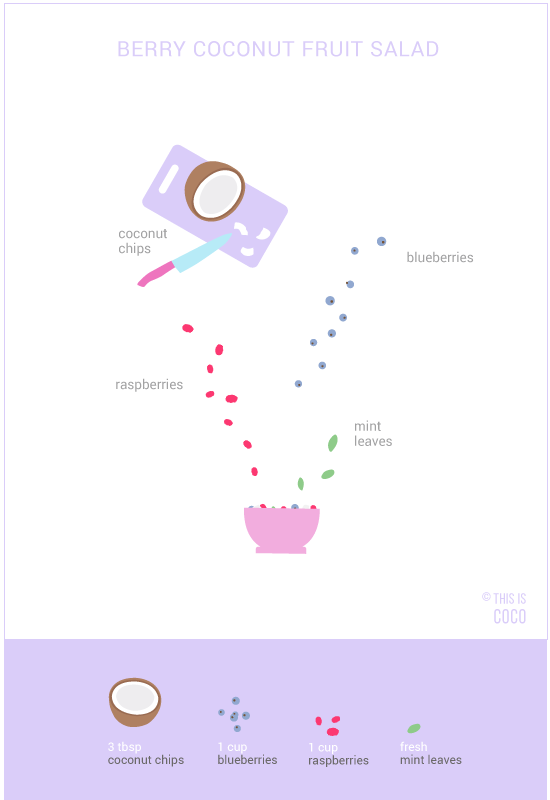 This berry coconut fruit salad is so simple to make and you can use whichever fresh berries you have. I used fresh blueberries and raspberries with coconut chips and fresh mint leaves from my garden. That’s all! It really doesn’t get more simple than this. You can top your berry salad with seeds and powders if you like such as chia, sesame, flex, amla powder, maca powder etc. Nuts also make a nice addition, but keep it light if you plan to work out after!